Never forget your dog's vet appointment again with one of our luxury dog memo boards. These pin boards are covered in a choice of doggy fabrics and they are all handmade to order for us here in England. Not only are they practical but they are very stylish too! They come in a range of sizes including a new desk size. Never forgot your dog’s vet appointment again! Our beautiful memo boards are available in a range of sizes including a desk size. Perfect for organizing all your dog’s papers and appointments whilst keeping your home looking stylish. Choose from a fantastic range of fabrics, each of our luxury notice boards are handmade for us here in the UK. 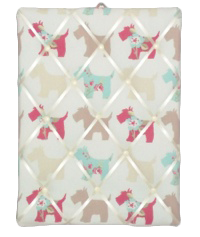 Finished with complimenting ribbon, our lovely pin boards also make the ideal gift for any dog lover.